Essential for healthy function of muscle metabolism. Contains leucine, valine and isoleucine in appropriate proportions. The branched-chain amino acids (BCAA) leucine, isoleucine and valine are essential amino acids that cannot be produced by the body and must be ingested from the diet. They are the third most important source of energy after carbohydrates and fatty acids. They are essential for healthy muscle metabolism and represent 35% of muscle volume. Moderate exercise increases the body's leucine needs by 240%. During prolonged exercise, the muscles convert a large proportion of BCAAs to alanine, which is used in hepatic neoglucogenesis. If BCAA concentration becomes too low, the muscle self-destructs' in order to provide the missing fuel. BCAAs therefore play an important role in endurance training. One study showed that 90 days' supplementation with BCAAs and glutamine by a group of rugby players significantly improved post-exercise muscle recovery and also increased stamina. They also have a stimulating effect on the immune system: when given to tri-athletes, they increased production of interleukin-2 and interferon following intense physical activity, thus protecting against the immune-weakening effects of such physical effort. They also have an impact on glutamine metabolism. Athletes who took BCAA supplements had plasma glutamine levels that were almost identical before and after a competition, while in those who did not supplement, levels dropped by 22.8%. BCAAs also seem to benefit sedentary individuals, by regulating the influx of tryptophan in the brain and so helping to prevent central fatigue. 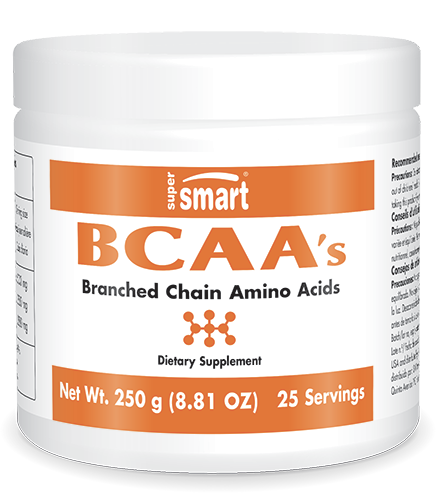 When taken before exercise, BCAAs help preserve muscle tissue and provide energy. Taken after exercise, together with glutamine, they speed up muscle tissue regeneration and significantly improve recovery. Some studies suggest that combining BCAA and citrulline could also reduce muscle fatigue. BCAA may also promote sports performance more generally. Hence the growing interest among sportspeople in these three essential amino acids, which have been compared to carnitine, a molecule synthesised from lysine and methionine. Other ingredients: magnesium stearate, microcrystalline cellulose. Each vegetarian capsule provides 500 mg of the three branched-chain amino acids L‑leucine (250 mg), L-isoleucine (125 mg) and L-valine (125 mg) in the ratio of 2:1:1.